How To Get Official Mobdro Premium APK Download – By this time you are now familiar with the Mobdro Premium app. As you know Mobdro Premium is the best streaming app for documentaries, live sports, movies, TV series and other contents from the web. To keep users interested, the Mobdro developers recently updated the app. Before, Mobdro had two versions – the Freemium version and the Premium version. The latest version of the Mobdro Premium APK is 2.0.62. But it is NOT what the users expect. Previously, the freemium Mobdro version had ads, no Chromecast support, no sleep timer and PVR capabilities. The developers made all the Mobdro Premium features available to all users which unified the two versions into one app. The only downside to this move is the app is now riddled with ads. Related – The 5 Best Channels On Mobdro – What Should You Watch? You can get the Mobdro Premium APK version of the app by following the guide below. There is only one version of the Mobdro app currently available – the Premium version with ads. This app is not available in the official Google PlayStore. There are apps named “Mobdro” in the PlayStore like Mobdro FR and Mobdro TV, but these are not the “Official” Mobdro Premium App. Follow the steps below to get the Mobdro Premium APK and install it on your Android device. The guide below is for those who haven’t installed the Mobdro app on their devices yet. Step 1. Enable “Unknown Sources” on your device by going to “Settings” > “Security“, then scroll down until you see “Unknown Sources“. Tap the toggle switch to enable it. Step 2. Using the browser on your device, visit www.mobdro.ca to download the latest Mobdro APK file. Step 3. With the file browser, open the folder containing the file (mobdro.apk) you just downloaded. Step 4. Tap on the mobdro.apk file to start installation. Step 5. Wait for the process to finish. Step 6. You will see the Mobdro icon on one of your screens after installation. Step 7. Launch the app by tapping on the Mobdro icon. You have just installed the latest version of Mobdro on your device. Watch the video below to see how the complete process is done. Next, you will update Mobdro app by using the procedure below. Step 1. Launch the Mobdro Freemium app on your device. Step 2. Tap on the three horizontal bars in the upper left hand corner of the main Mobdro screen. Step 3. You will see the screen below. Tap on “About” to show more information about the Mobdro app installed on your device. Step 4. Check the version on the Mobdro app installed on your device from the screen. If you see any version lower than 2.0.62, then you should tap on “Check For Updates” to get the latest version. Step 5. Let the app download and install the latest version of the mobdro app. Step 6. You can now enjoy the latest version of Mobdro after the installation complete. What’s New In Mobdro APK Version 2.0.62? This version of the Mobdro app was released last January 28, 2018. The release added two new bug fixes and some minor improvements to the program. Although this is NOT a major update, users are still urged to update and use this latest Mobdro app to get rid of any issues while streaming videos and using the app. For those interested to know, below are the fixes and improvements included in this new version. Fixed a bug which caused favorite and recent items to disappear after rebooting. Fixed a bug which caused some available streams to show up as offline. Improvements made in the player engine. If you haven’t installed or updated the Mobdro app on your device(s), you can use our guide above to do it now! Please share this post with your friends if your found it useful. Having problems with your Mobdro installation? You can leave a comment below or get in touch with us by clicking on this link. Each channel has tons to videos for everyone to enjoy. From animals, cartoons, documentaries, movies, sports to TV series, Mobdro covers everything the video enthusiasts wants. The Mobdro app offers a lot of benefits for users. First and foremost, it has a Freemium version which anyone can download without cost. Second, video stream in every genre and language are always available anywhere and anytime. Third, users can save more money if they cut their cable subscription and use the Mobdro app instead. This is true for everyone but most especially for the sports enthusiasts. Sporting events (both live and recorded) are happening around the globe every single minute. Mobdro scours the internet for all the available sports competition. The app aggregates all of these and make them available on its “Sports” channel for your convenience. If one wants to watch these sporting events, either you have to be in the country where the contest is being held or pay a provider to watch it. Subscription/tickets to these events may greatly vary in price depending how popular it is. Besides, its out the question to travel to different countries just to see each sporting event at a time. Unless you are extremely rich and want to do so. We all know that aside from Mobdro there are other free streaming apps in the internet. These alternatives have similar capabilities like the Mobdro app. Since Mobdro is not limited just to one sports channel like other subscription based services, sport fans are now asking if Mobdro is the best free sports TV app in existence today? This post will not be complete if we don’t include the comprehensive list of all sports channels that are available in the Mobdro app. Check out the list below to see the sports channels you get when you install Mobdro. More sport channels are being added all time so the number of Mobdro’s sports channel keeps getting bigger everyday. Because of the reasons mentioned above, we can say that Mobdro is the best free sports TV app available for your devices today. It has great quality sport streams anytime you want to watch and you don’t have to spend a single cent to watch all of them. The video below shows how you install Mobdro on your device and watch all the sports event you want for free. Mobdro – your app for all free streaming videos from the net and more. You can get the latest version of Mobdro by clicking this link. Please share this post with your friends if you found it useful. We would also like to know your thoughts so kindly leave a comment below. How To Fix Mobdro Not Working On Bluestacks : Easy Methods – By now, you may already have the Mobdro app installed on your computer. To run Mobdro on your computer you need Bluestacks or other Android emulators. As we all know, Mobdro was specifically developed for the Android operating system. an Android-only tool that constantly looks for free video streams available on the web and makes them accessible on your mobile device. The Mobdro app allows viewing of documentaries, movies, live sports, TV series and other contents from the web on your devices. The best way of installing Mobdro on your computer or Mac is by using the most popular Android emulator, Bluestacks. You can download the Bluestacks emulator for the PC from this link, or for the Mac from this link. We already have a tutorial on how to install Mobdro on your computer or other devices using Bluestacks emulator. Just follow the steps provided in that guide to get Bluestacks installed on your gadgets. Once you get Bluestacks installed and running on your device, you can then follow this guide to install the Mobdro app on Bluestacks. Channels – includes popular TV channels which shows well-known series. News – news channels from all over the world. More are being added all the time which means more entertainment for every Mobdro user. There is a category for everyone who enjoy watching streaming contents from the internet. Best of all, users get access to these online streaming content for free using the Mobdro app. The most common cause of Mobdro not working on Bluestacks is connection/network error. You may get “No results found. You may try choosing another language” error when you click on “Channels” while using Mobdro. Compatibility issues with the Mobdro app and Bluestacks may also be a reason why the former won’t work with the latter. Just follow the steps below to fix this error and other errors you may encounter while using Mobdro on Bluestacks. As mentioned above, connection/network problem and compatibility issues are the usual causes of Mobdro not working on Bluestacks. The solutions to this problem are easy. You can do them by yourself and you won’t have to pay anyone to do it for you. Do the steps below to fix this problem. Step 1. Visit any website using a browser on your computer. If you can access/view the site, this means you have internet connectivity. Check your internet connection speed also (click here) to determine if it is fast enough for Mobdro’s minimum requirement of 2 megabytes per second (mbps) for standard definition streams/videos. Step 2. Check your network setting if you are using Google Public DNS. You can configure your network setting to use Google Public DNS by using this guide. Step 3. After doing the steps above, launch the Mobdro app using Bluestacks to see if it is working now. By doing the procedure above, you should now have Mobdro working with Bluestacks. If Mobdro is still not working, do the procedure below. Step 1. Check the version of Bluestacks Android installed by opening a browser in the emulator and visiting this site. Mobdro is compatible with Android version 4.1 and above. Step 2. Check Mobdro version installed on Bluestacks. The latest version of Mobdro is 2.0.62. Do this by clicking on the three horizontal bars in the upper left hand corner of the Mobdro app then click on “About“. The first item listed is the Mobdro version installed. Step 3. If you find an older version of Mobdro installed, you can tap “Updates” to download and install the latest Mobdro version. Step 4. After updating to the latest version of Mobdro, launch the app and see if the problem has gone away. You can watch the video below to see the correct way of installing Mobdro on Bluestacks to avoid any errors. You have just learned how to fix Mobdro not working on Bluestacks. Please share this post with your friends if you found it useful. We would also like to know your thoughts so kindly leave a comment below. Fix for ALL Mobdro Errors with Kodi – Kodi (formerly known as Xbox Media Center/XBMC) is a content streaming app that can be installed on any platform. If you like to watch streaming media from the internet then you probably have Kodi installed on your devices. One of the best add-on for Kodi is Mobdro. 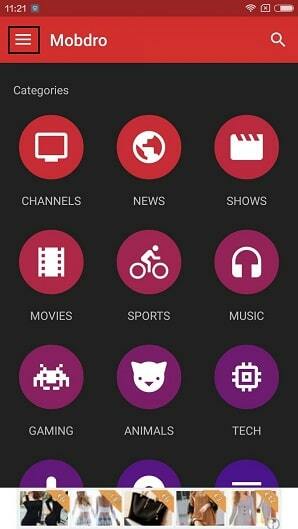 Mobdro is an Android only app that constantly scours the web for free streaming media content. These may include movies, music, live news feed, sporting events, TV series and videos in any language. If you haven’t installed the Mobdro add-on for Kodi yet, you can follow our guide by clicking on this link. The video below also shows you the installation process so watch it. Sometimes, users encounter problems with Kodi addons and this may include Mobdro. Mobdro errors with Kodi range from unknown errors to not working issues. Check Log File Error – If you are using an older version of the app, this error may occur. Currently Offline Error – This error appears when the feed you want to view is not available from the server. Parse Error – This error results when the apk file you downloaded is corrupted or incomplete. This may also occur if your Android operating system is below version 4.1. No Connection Error – This error occurs when you have a slow or intermittent internet connection. Video Playback Error – Users encounter this error while streaming online videos and the video app crashes. Now that we know the causes of Kodi Mobdro addon, we can now offer a solution to these problems. Read on to learn how to fix all errors on Kodi with Mobdro. Look for the error you are having with Kodi Mobdro Add-on and follow the suggested steps or solution for your particular problem. Step 1. Open Kodi on your device. Step 2. Choose “System” from the menu. Step 3. Install “Log Viewer For Kodi“. Select “Add-ons” > “Install from repository” > “Kodi Addon repository” > “Programs Addons” > “Log Viewer for Kodi” > Choose “Install“. Step 4. After installation, go back to the “Home Screen“. Choose “Programs” > “Log Viewer For Kodi” > “Show Log“. Step 5. You can see more info and what’s causing the error from the “Log File“. Step 6. Go back to the “Home Screen” and choose “Program” > “Addon Installer“. Step 7. Key in “Maintenance Tool” in the new window and choose “Done“. Maintenance Tool will be installed. Step 8. Now select “Programs” > “Maintenance Tool” > “General Maintenance“. Step 9. In General Maintenance, choose “Clear Cache” and click on “Yes” to confirm. Step 10. Again, select “Purge Packages” and click “Yes“. This should solve the “Check Log File Error“. Another way to fix this error is to “uninstall” the old version of the Mobdro addon for Kodi and update to the latest version of the app. There is nothing you can do to fix this error on your side. The problem lies with the server where the files/contents are hosted. You can only wait for the contents to be available again so you can access them. You can regularly visit the channel to see if the content you want is already available. As mentioned above, the Parse Error is caused by a corrupted apk or an incompletely downloaded file. Make sure that the file the apk file you are using is not corrupted and completely downloaded before installing it. Also, if you have an Android OS lower than version 4.1, update first to the latest that your hardware support before installing the Kodi Mobdro addon. Kodi with Mobdro addon requires a minimum internet speed to stream contents fluidly. The recommended minimum internet speed to stream standard definition videos is 2 megabytes per second (mbps). For other video standards (High Definition, 3D or 4K), the internet speed requirement is much higher. Make sure you have a consistent and fast internet connection to eliminate this problem. This error may also occur depending on the service provider that the app is trying to connect to. If the service provider is currently offline, then all you can do is wait for them to be available again. This problem is related to the “Currently Offline Error“. Users encounter this error while already streaming videos. As mentioned, the “video player” app crashes thus triggering this problem. The suggested solution for this error is to select another video player for the addon to use instead of the default one. There you have it – our guide to fixing ALL Mobdro error with Kodi! Fixing Mobdro errors with Kodi become easy if you follow our guide above. You can continue enjoying error free content streaming on Kodi using Mobdro addon by following these simple solutions. Please share this post with your friends if your found it informative and useful. Have questions or just want to connect with us? You can leave a comment below and we will get back to you. You can also contact us here. The 5 Best Channels On Mobdro – What Should You Watch? The 5 Best Channels On Mobdro – What Should You Watch? – If you have been closely following our posts, then by now you have a pretty good idea about Mobdro. a tool that constantly looks for free video streams available on the web and makes them accessible on your mobile device. Its an amazing application that is supported on almost all Android devices. From our in depth testing we can confidently say that the Mobdro developers have created an amazing application that provides end users with great quality and fast free video streams. The application is smooth and unlike others, it does not crash. From live news streams to your favorite sporting channels, and to multi-language content this application is a must. Mobdro has recently been updated to version 2.0.60. As you know, Mobdro was specifically developed for the Android operating system and this latest version of the app is compatible with Android 4.2 and up. Version 2.0.60 brings all “Premium” features to everyone. This means you no longer need to buy the Premium version of the app if you have the Freemium version installed on your device. All you have to do is update to this latest version and you will automatically have all features of the Premium version. The Premium version of the app allows users to capture/download streams and has Chromecast support. For this article, we are going to find out the 5 best channels on Mobdro. Read on to know if your favorite channel is included in my list. Picking the 5 best channels on Mobdro is a bit tricky. Each users have different preferences when it comes to watching content. Some may prefer sports while others movies or TV series. So for my list, I picked my most watched channels from the Mobdro categories. 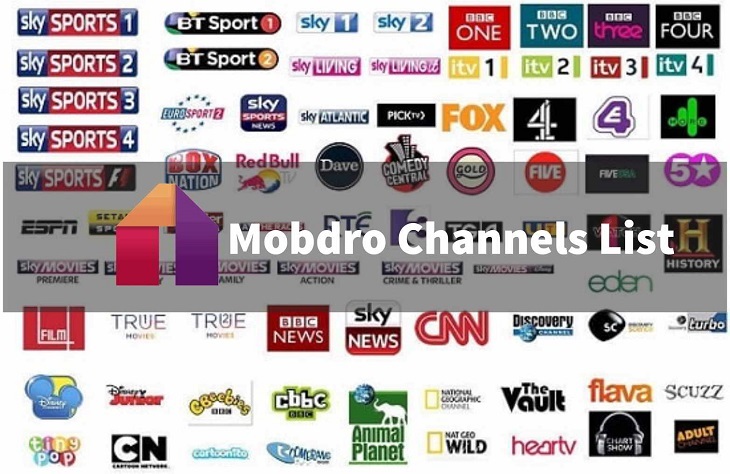 Mobdro has tons of channels contained in each category and its almost impossible to list all of them. New ones are being constantly added everyday – the reason which makes narrowing the list to the best 5 channels tricky. With that said, it all boils down to the users’ preferences. For instance, your family and friends probably have multiple devices with the Mobdro app installed. One member may like sports while another one may like music videos or action movies. Same goes with your peers who may have a leaning to world news or is into nature. These determine the kind of channels they would likely watch. Listed below are the 5 best channels on Mobdro as far as I am concerned. These are my 5 most watched channels on Mobdro because they have all the shows I like and their stream are always available. Of course, your list may greatly differ from mine but that’s exactly what I want to point out here. First up is HBO. Found under the “Channels” category, HBO has an extensive list of movies and original series. Aside from these, HBO also has other contents specially made for “kids” and “specials“. If you’re a fan of popular series like Game Of Thrones, then HBO is the channel for you. Next on my list is AMC. A little bit of trivia first : did you know that AMC originally stood for American Movie Classics ? Since 2002, the acronym has been downplayed because of the network’s shift in programming. Fans of “Breaking Bad“, “Mad Men” and “The Walking Dead” will surely have AMC on their list. I enjoy watching all kinds of movies that’s why the “Movies” channel is third on my list. From action movies to musicals, you’ll find everything in between in Mobdro’s “Movies” channel. I tune in to BBC News to know the latest happenings in the world. The British Broadcasting Channel was founded in 1922 and is one of the largest and oldest channel in the world. BBC News provide accurate and timely reports of current events from all over the globe. Finding new things and exploring our world from the comforts of our homes is easy with Discovery. This channel started with documentaries but has now expanded their programming with reality TV and scientific related infotainment. This channel is listed fourth in my compilation. Last but not the least is MTV. The channel aired music videos when it started in 1981. Initially targeting young adults who were heavily into music videos of their favorite artists in the 80’s, the channel has added shows, news and live tv to its programming. Its likely that you have a channel or two similar to the ones in my list. Please share this post if you found it informative. We’d also like to hear from so kindly leave a comment below. Thanks! Is Mobdro Safe and Legal to Download, Install and Use? Is Mobdro Safe and Legal to Download, Install and Use? – Wondering if Mobdro safe to install on your devices? Maybe you are concerned if it legal? You are not alone. A lot of people are asking the same questions so I did a lot of research and reading to know more about Mobdro’s safe use and legal issues. Is Mobdro safe to download? Is Mobdro safe to install? Is Mobdro safe to use? I found some interesting facts from my research and I would like to share them with you here. As you know, Mobdro is an app that continuously searches the net for free streaming contents. These contents may be in the form of music, videos or TV series. The streams are not restricted to any region and can be in any language. Mobdro does a great job of scouring the web for all types of streaming content from all over the globe. A straightforward and honest answer to this question is YES. There are some facts you should take note of though. First, you must get the Mobdro app from the official site. This is to make sure that the apk file you are downloading is free from any malware or virus. You can find other sites that host the Mobdro app but these may not be the official Mobdro app. As mentioned above, the file from these questionable sites may contain harmful code for your devices. These sites may also be phishing that are out to get your personal data. If you are have doubts of the sites and the file, stay clear of both. To make Mobdro even safer and kid-friendly, the app has a built-in “Parental Control Filter“. If you are a parent, you can turn on this feature to make streaming safe for your child. The feature “filters” out age inappropriate (read : adult) contents from the streams. You can be sure that only kid-friendly streams are delivered by Mobdro to your child’s device(s). We have established that the Mobdro app is safe to use but is it legal? Mobdro crawls the web for free streaming videos. The app may provide contents from other sources, like torrent sites, which users say are pirated. The fact that they are “pirated” makes them illegal. The use of the Mobdro app therefore is in the grey area of legality. Remember, the Mobdro app does not have any control over the video streams it provide users. The app only indexes these contents and make them available to users and their devices. You may get in trouble if the content your are watching via Mobdro is pirated. To be safe, you can use a Virtual Private Network (VPN) client that hides your location/IP address. The VPN client allows you to surf the internet anonymously. There hasn’t been any report of people going to jail while watching streams using Mobdro. In fact, users from countries like Canada, India, Ireland, the Philippines, the United Kingdom, the United States, and other places enjoy Mobdro without any threat of imprisonment or penalty. But if you feel safer if you use a VPN client then by all means use one. You can easily find a VPN app/client from the Google Playstore or from reliable third party websites. Watch the video below to learn more about VPN and how to install one on your device. Related to this subject, I tried to search for countries where Mobdro use is considered illegal. So far, I haven’t found any authority in any country that specifically outlaw the use of Mobdro. Before you install the app, you should read Mobdro’s “End Users License Agreement (EULA)” to know what you’re getting into. This is the best way to know the “legal” side of downloading, installing and using the Mobdro app. Don’t panic though. The “EULA” doesn’t say anything frightening. In fact, this agreement clearly outlines what you need to know before using Mobdro. It also defines the capabilities and the limitations of the app. For instance, users who install the app agree to all the terms and conditions mentioned in the “EULA”. It is also the users responsibility to “protect” themselves as Mobdro has no control whatsoever to the contents that the app catch from the net. In conclusion, I will say that the Mobdro app is both safe and legal to use. Just make sure you read and understand the app’s users agreement before you install Mobdro on your devices. To help you get more from the Mobdro app, you can visit this link for other informative articles. Please share this post with your friends if you found it useful. Still have some questions about Mobdro? Leave a comment below or get in touch with us here. How to Download, Install and Watch Mobdro on Chromecast – The latest Mobdro release supports Chromecast. This is similar to what we did on Roku. It’s more interesting and exciting to watch movies and TV series with your loved ones on a big screen. The Mobdro app allows you to do this using your Chromecast device connected to your TV. Although Mobdro was specifically developed for the Android OS, it can also be installed on other devices like Android TV boxes, Chromecast, Kodi, Laptops/PCs, Macs and Smart TVs. Aside from this, the Mobdro app can do a lot more once you have it installed on your gadget. For this article, I am going to show you how to watch movies and other contents using the Mobdro app and Chromecast. The first thing you’ll need for this work is a device with the Mobdro app already installed on it. It can be an Android smartphone or tablet, a laptop/PC or even a Mac. If you have a device and you want to install Mobdro on it, you can out our guide to easily get the app up and running on your gadget. Next, of course, is your Chromecast which you have to connect to your TV. This guide shows you how easy it is to connect you Chromecast to your TV. Before, the streaming option was only available on the “Premium” version of the app. Now, Mobdro developers has made all premium options free to everyone! Follow the steps below to start streaming Mobdro on Chromecast. Step 1. Download and install the Google Cast app (also known as Chromecast app) on your device. Step 2. Launch the Mobdro app of your gadget. Step 3. Connect your Chromecast device to your TV. Make sure that it is powered on. Step 4. Make sure that both (your device with Mobdro installed and your Chromecast device) are connected to same Wi-Fi network. Step 5. The Mobdro app will detect your Chromecast device and show the “Cast” icon beside the “Search” icon in the “Notification Bar” of the app. Step 6. Tap on the “Cast” icon and confirm that you want to stream the content on your device to your TV via Chromecast. Step 7. Open any content on your device using the Mobdro app and watch it on your TV using Chromecast! What could be easier than that? You have just downloaded and installed Mobdro on Chromecast using our easy to follow guide above. Start watching your favorite video streams on your TV’s bigger screen now! You can watch the video below to see how streaming works using Mobdro and Chromecast. Watch your favorite movie or TV series on a bigger screen using the Mobdro app via Chromecast. Watching video streams on a bigger screen is more exciting using Chromecast. Share your content with your loved ones making the experience more meaningful. Mobdro streams are free therefore you don’t have to pay for anything. Surprise yourself with the ever-changing Mobdro content. Channels and content are being added every time so you will have an unending source of entertainment and education. Mobdro finds streams in every language so there is always a stream for everyone. These are just some of the myriad advantages of Mobdro on Chromecast. If you found this post informative and useful please share it with your family and friends. Want to connect with us? Kindly leave a comment below if you encounter any problem in downloading, installing or watching Mobdro on Chromecast. Maybe you just want to share your experience using Mobdro – that would also be great and we want to hear what you have to say! is a tool that constantly looks for free video streams available on the web and makes them accessible on your mobile device. From live news streams to your favorite sporting channels, and to multi- language content this application is a must. Mobdro was particularly developed for the Android operating system. The app can be installed on other devices like the Android TV boxes, Chromecast, Kodi, Laptops/PCs, Macs and Smart TVs. For this article, I am going to show you how to install Mobdro for Roku the best and easiest way. Roku is a streaming media gadget that connects to your TV. There are several types of Roku devices namely the Roku Express and Express Plus, the Roku Streaming Stick and Roku Streaming Stick Plus, the Roku Ultra and the Roku TV. Roku devices need an internet connection to stream contents to your TV. With the exemption of the Roku TV, other Roku devices have to be connected to your TV using USB, HDMI or the older audio and video cables. If you enjoy streaming movies, videos, TV series using your Roku device then you will surely love having Mobdro on your Roku gadget. This combination will allow you to get more content from the internet to watch on your TV. You will need your Android device (smartphone or tablet) with the Mobdro app already installed for this to work. You can check out this guide on how to install Mobdro on Android if you don’t have the app on your gadget. We will use “casting” on your Android device and “screen mirroring” feature on Roku to have Mobdro streams on your connected TV. Just follow the steps below to learn how to install Mobdro for Roku. Step 1. Make sure your Android device and your Roku gadget are connected to the same Wi-Fi network. Step 2. Turn on your Roku device (already connected to your TV). Step 3. Now go to “Settings” then to “System“. Step 4. Look for the “Screen Mirroring Option” in the right side of the menu. Step 5. Click on the option to “Enable Screen Mirroring” feature. Step 6. On your Android device for to “Settings” then “Display“. Step 7. Scroll down until you see the “Cast Screen” option. Tap on it. Step 8. Toggle the switch to turn on “Cast Screen” option. Step 9. Connect your Android device to the Wi-Fi network. 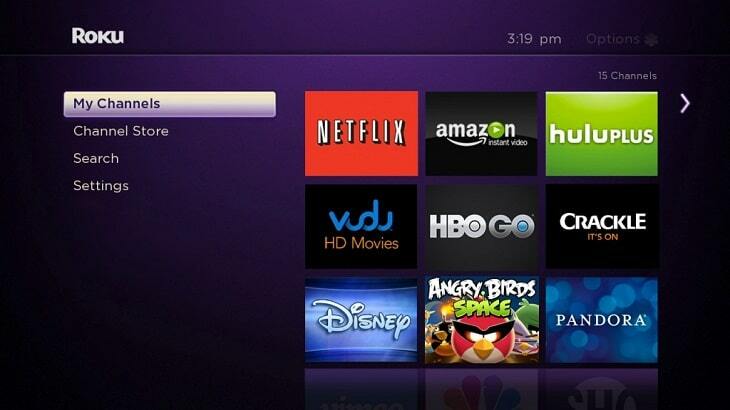 Your android device will look for your Roku gadget. Step 10. Select “Roku” when it appears on your Android device. Step 11. Your Roku and Android devices will now be connected and anything that shows on your Android display will shown on your TV screen. With your Android device and Roku connected, all you have to do now is to open the Mobdro app on your smartphone or tablet. Choose any content you want to watch and start streaming to your TV using your Roku device. You can watch the video below to see how “screen mirroring” is done using Roku. We didn’t actually install Mobdro for Roku using this procedure but we were able to achieve the same result. The Mobdro app has lots of channels that range from “live” feeds to sporting events from all over the world. It also has the latest movies and popular TV series for you to watch. Mobdro can also “catch” streaming videos in many languages. Now you can watch streaming movies, videos, TV series and other contents using Mobdro and Roku. You can visit this link to get the latest version of the Mobdro app. After downloading the file, you can install Mobdro on your devices (Android and other gadgets) by following our “easy to do” guide here. Please share this post with your friends if your found it informative and useful. Also, we would like to hear what you think so kindly leave a comment below. Where to Download Mobdro for Android, PC, Kodi, iOS, Chromecast & Mac – Mobdro is an Android-only app designed to search the entire internet for free streaming videos. If you enjoy watching streaming movies, TV series and movies for free then Mobdro is for you. By now you may have the Mobdro app installed on your devices. You are enjoying free streaming of movies, TV series, videos, and other multimedia contents on your gadgets. Mobdro scours the net all over the globe for free streaming content. It also has lots of TV channels from all over the world in many different languages. You may be wondering if you have the latest version of the app installed on your device. Perhaps you want to update your Mobdro installation and want to download the latest version. Just follow the steps below to check the app version installed on your device. Step 1. Open the Mobdro app on your device. Step 2. Click the three horizontal lines in the upper left hand corner of the main screen. Step 3. A new screen will slide from the left (see below). Step 4. Tap “About” to see the more information about the Mobdro app installed on your device. The first item on the “About” screen will show you the Mobdro version installed on your gadget. Step 5. You can also check for updates on this screen if you want to. Make sure you are connected to the internet. You now know the version of the Mobdro app installed on your device if you followed the guide above. The current version of the Mobdro app is 2.0.58. This was released last November 19, 2017. The latest version of the app brings bugs fixes and other improvements. When users installed Mobdro version 2.0.56, they complained that they could hear the sound but cannot watch the video on their respective devices. This was not an isolated case as people from around the world had similar complaints. All Mobdro users were angry because of this. Solutions to the problem were hot on Google searches. Users were advised to downgrade to a “lower” or previous version of the app to fix this problem. Mobdro is a very interesting and useful app for streaming online content. Those who do not have Mobdro installed on the devices want to know where to download mobdro. Mobdro is not available in the Apple AppStore and Google PlayStore. You may find apps named “Mobdro” in both stores but they are “fake” apps. These apps do not have the functionality of the “original” Mobdro app. Do not install these apps because they may contain malware or viruses that could harm you devices. The best site to download Mobdro is here. As mentioned before, Mobdro was created for the Android operating system. Therefore, you will get an “apk” file when you download the Mobdro file. You can check out this link or this one if you need other (previous) versions of the app. You can then “sideload” the apk file to your device to install it. You can follow the steps below to install Mobdro on Android devices like smartphones and tablets. Step 1. Enable “Unknown Sources” on your Android gadget. You can do this by going to “Settings“>”Security” then scroll down to “Unknown Sources“. Tap then toggle the switch to enable it. Step 2. Using the browser on your device, visit this link. To start the Mobdro app download, click “FREE DOWNLOAD”. Step 3. Tap on the file after the download completes to start Mobdro installation. Step 4. You will see the Mobdro “icon” on one of your screens or the app drawer after installation. Tap on the it to launch Mobdro. You can watch the video below to see how the process is done. We already have a guide on installing the Mobdro app on other devices like the PC/laptop, Kodi and Chromecast. You can check out the guide by clicking on this link. You will need an Android emulator for the PC or the Mac to be able to run Mobdro on these devices. Those who own an Apple device like iPhones, iPads and iPods still have to wait for the Mobdro app to be ported for their gadgets. Please share this post with your friends if you found it informative. We would love to know what you think so kindly leave a comment below.